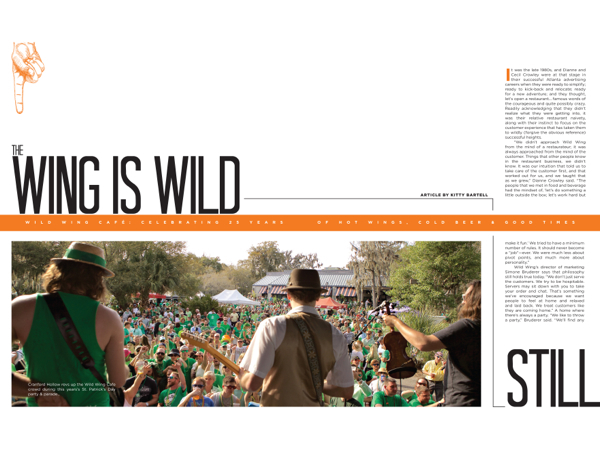 Cranford Hollow revs up the Wild Wing Cafe crowd during this years’s St. Patrick’s Day party & parade. It was the late 1980s, and Dianne and Cecil Crowley were at that stage in their successful Atlanta advertising careers when they were ready to simplify; ready to kick-back and relocate; ready for a new adventure; and they thought, let’s open a restaurant… famous words of the courageous and quite possibly crazy. Readily acknowledging that they didn’t realize what they were getting into, it was their relative restaurant naivety, along with their instinct to focus on the customer experience that has taken them to wildly (forgive the obvious reference) successful heights. Opening day in 1990, there were seven well-tested wing flavors on the menu, and today there are 34. “We’ve come a long way since them, but it’s still a part of who are,” Bruderer said. The Wild Wing menu committee is composed of a core group of corporate employees and representatives from several of the company’s franchises. Always working to be responsive to the individual markets of the 14 corporate restaurants and 23 franchises (and growing), the menu committee keeps an eye on what works in the individual communities. The Wild Wing customers contribute with new menu inspiration as well through Battle of the Bone competitions. Similar to a bracket challenge, customers are asked for new wing sauce ideas. The field is narrowed to 16 contenders, and every week, two go head-to-head until winners are selected and added to the menu. Most recently, the Crazy Daisy, a barbeque-ish, spicy, sweet sauce and Honey Lime Sriracha sauce came out on top. Wild Wing Café first opened on June 23, 1990, overlooking Hilton Head’s Coligny Plaza duck pond, expanding a couple of years later to their current location on Pope Avenue. Rumored to be first to bring live music to the party, along with their still-popular buckets of beer, this island classic is looking at 25 years in the rearview mirror, and the Crowleys, their devoted fans, friends, and their former and current employees, are ready to celebrate this milestone in a big way, culminating with a birthday bash on Sunday, June 21. “We’re throwing a big party, naturally,” Bruderer said. A child of Wild Wing herself, Bruderer grew up on Hilton Head Island. “It would be the place that I would go with my friends to watch sports and hang out, eat some wings, and catch some awesome bands.” It’s in her blood. The week leading up to the big party, there will be a wing eating contest, a throwback to the ’90s night, where friends of Wild Wing are encouraged to dress in ’90s-style and come out to enjoy a ’90s band; and the Friday before the birthday blast, a VIP customer appreciation party is planned. The weekend will culminate with a blow-out birthday party, featuring four bands, games, bounce houses, and more. In addition to Nashville’s Grammy-nominated Will Hoge, Hilton Head’s The Steppin’ Stones, and an act yet to be determined, the winner of South Carolina’s Red Hot and Rising Music Award, will be performing. The winner of this up-and-comer award will be announced the first week of June and will rock the Wild Wing Café birthday celebration. Born at the beach, Wild Wings Café and the Crowleys have certainly found their sea legs and are ready to celebrate… crazy brilliant! tom peoples might have done the first one,but the one and only “des”,dandl contractors inc. renovated the old tgif to cecil and dianes specs. best owners to ever work for!the place is rockin’! !